Remember when your mother used to tell you to stand up straight? Well, this blog post is going to sound nothing like her (probably), but I AM going to tell you to stand up straight. Why? Because it’s the most important lesson I can teach you as a Master Trainer and Pilates Instructor. Proper posture not only will help you look better, it will help you feel better too. Poor posture can result in all kinds of nasty results including neck pain, back pain, shoulder pain, strain of the lumbar spine, pain in the hips, digestive issues, weight gain and cardiovascular disease. Poor posture results in misalignment and imbalance of the body, which restricts our movement and leads to chronic body issue that only get worse with age. This is why I have been so focused on incorporating proper posture training into every single session lately. As a personal trainer, it’s my job to help my clients achieve life-long health and it all starts from the head down. So what is posture exactly? According to Britnell et al. (2005), posture is a state of skeletal and muscular balance and alignment that protects the supporting structures of the body from progressive deformity and injury. Proper posture allows the muscles of the body to function with maximum efficiency. In other words, good posture is standing/sitting up straight with very little effort. Recently, I noticed that I have been experiencing one of the most common forms of poor posture known as “Forward Head Posture (FHP).” People with FHP tend to develop a habitual head misalignment while sitting at computers, look at our phones, watching tv, driving, and surprisingly even talking to others. FHP is associated with neck and shoulder pain incorrect alignment of the lower jaw to the skull. In addition to the musculoskeletal imbalance caused by FHP, this condition has also been linked to fatigue, restricted motion of the neck and chronic neck pain. According to Luke Ferdinands, owner of Post Physical Therapy, a program focused on strengthening the cervical flexors and shoulder retractors combined with stretching of the cervical extensors and pectoral muscles was most effective in helping to correct this posture problem. 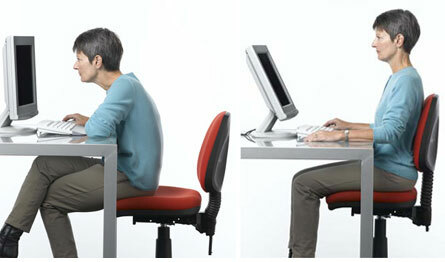 We’re evolving in the wrong direction when it comes to posture! Check out this video to learn exercises to strength posture to its ideal alignment. I am committed to helping clients maintain and restore posture for life long health. Below is a list of posture do’s and don’ts that will help you gain better posture. Examine yourself to find out when you might be sitting or standing in a misaligned way. Use the checklist every day to make small changes in your posture. When you exercise, focus on keepings your spine long and straight. All of these little changes throughout your day will eventually build up in to better posture for a lifetime. 1. Become body-aware. 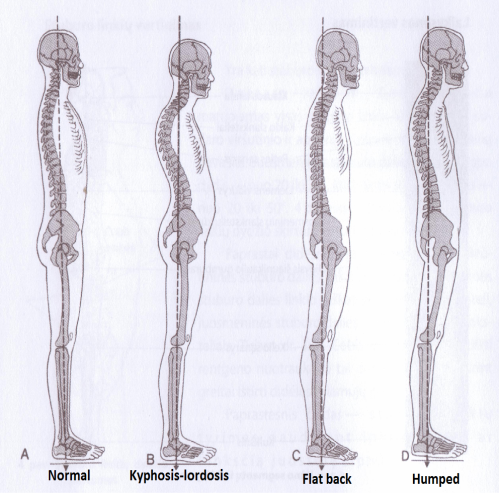 Learn about yourself and when you tend to stand/sit up straight vs. when you tend to slouch. By understanding your own habits, you will better be able to correct them. 2. Try not to sit down within the first hour after waking up. Adams, Dolan and Hutton (1987) showed that pressure on the lumbar disks is 300% greater in the first hour after waking than it is later in the day. 3. Participate in exercise programs that are designed for musculoskeletal injury prevention. These programs involve joint stability exercises, balance training, using wobble boards, roller boards, resistance balls, plyometric (jump and/or explosive reaction) exercises, yoga and Pilates. 4. Sit consciously. Keep your head up over the shoulders, with your back maintaining its three natural curves. If you’re sitting at a computer, your eyes should be level with the top portion of the computer monitor. Keep your shoulders back and relaxed. Thighs and forearms are perpendicular to the floor, with feet planted on the ground. The monitor should be 18–30 inches away and directly in front of the head. 5. Take regular breaks when sitting for prolonged periods, get up and stretch or go for a walk. 6. Stretch it out: your hip flexors, hamstrings and neck extensors should be stretched daily. What do you notice about yourself when it comes to posture? What have been your posture pitfalls vs. posture successes? Tell me on Facebook, Instagram and Twitter using #PosturePhyl.